We are currently working on a project similar to Mapping Madrid in home town Porsgrunn where a major theatre event called “Stedsans” is held for the fift time this year. This time the projected map will be a air photo of Porsgrunn and the surrounding area, and the pictures will be from the earlier events of Stedsans. I have never heard of any crop circles in this area so I though that “this is big!”. I am avare that the images used can be several years old and that the circle probably was gone by now. However I wanted to find out just how old they where, so I could search lokal newspapers and other sources for unusual events araound the time the pictures where taken. I contaced gulesider.no to find the source of the image database. They politely forwarded me to Statens Kartsentral which translates the State Map Center. I sendt them a mail with the GPS coordinates, explaining the issue and asking for the date of the images. I never got any respons. Here comes the weird part: A couple of weeks later I wanted to show the phenomena to a friend opened the browser on the gulesider maps. The crop circle was gone! Now I should explain that I am a great sceptisist of “supernatural” phenomenas like crop cirles. I have allways beleived that human beings are clever folks well capable of making these patterns just to have a laugh at the people beleing they come from outher space. I just havent figured out HOW they have made them and I thus keep an open mind. The real question is not hwo made the cirle and how. It is: Why did the gouvernment remove the evidence? What are they trying to hide? We are currently working on a project similar to Mapping Madrid in home town Porsgrunn where a major theater event called “Stedsans” is held for the fifth time this year. This time the projected map will be a air photo of Porsgrunn and the surrounding area, and the pictures will be from the earlier events of Stedsans. I have never heard of any crop circles in this area so I though that “this is big!”. I am aware that the images used can be several years old and that the circle probably was gone by now. However I wanted to find out just how old they where, so I could search local newspapers and other sources for unusual events around the time the pictures where taken. I contacted gulesider.no to find the source of the image database. 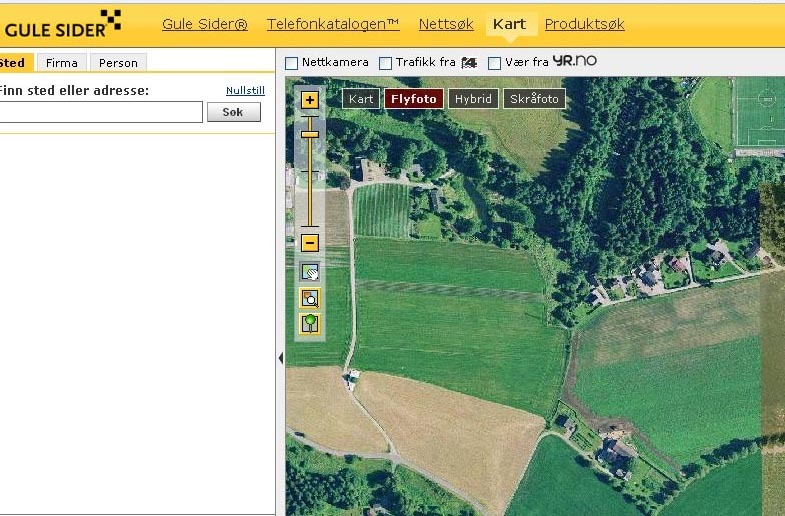 They politely forwarded me to Statens Kartsentral which translates the State Map Center. I sent them a mail with the GPS coordinates, explaining the issue and asking for the date of the images. I never got any response. 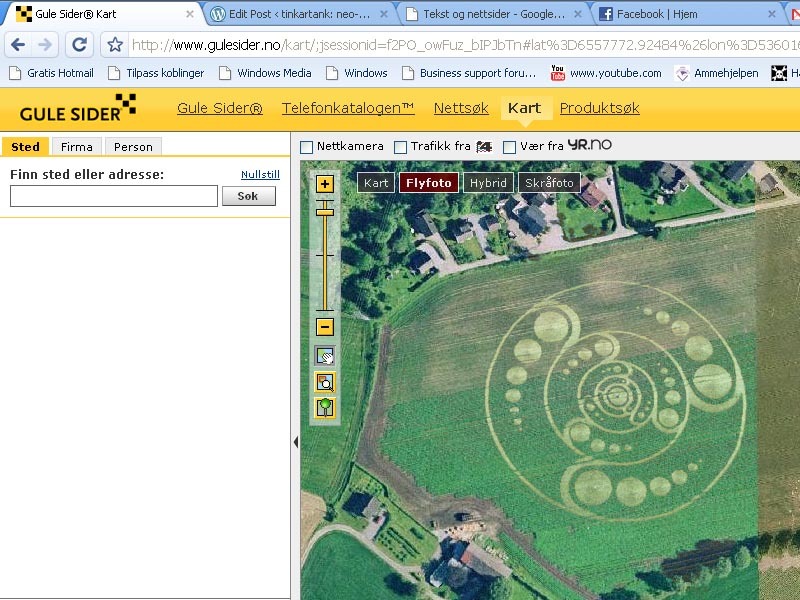 Now I should mention that I am a great skeptic of “supernatural” phenomenas like crop circles. I have always believed that human beings are clever folks well capable of making these patterns just to have a laugh at the people believing they come from outer space. I just haven’t figured out HOW they have made them and thus I keep an open mind. The real question is not who made the circle and how. It is: Why did the company remove the evidence? What are they trying to hide?